If parents want to raise a reader, someone who engages in reading regularly and voluntarily, they should read aloud to their children. Put away the flashcards and take down the sticker charts for number of books read. Make reading aloud every day a priority. As a parent myself, I realize that this task can be sometimes difficult. There have been evenings when reading aloud didn’t happen in our home due to work or other obligations. However, we have made it a ritual, as regular as brushing our teeth. The science that supports reading aloud to children, both at home and in school, is clear. Next are some of the biggest benefits, although this list is not exhaustive. 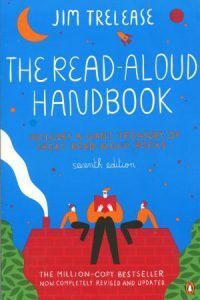 Two books reference much of the research on reading aloud: In Defense of Read-Aloud by Dr. Steven L. Layne and The Read-Aloud Handbook by Jim Trelease. Trelease’s resource is in its 7th edition now and should be in the home of every family. Some hospitals will send The Read-Aloud Handbook home with new parents. It was a book I relied on when I taught elementary school. BUT WHAT IF I HAVEN’T READ ALOUD TO MY CHILD UP UNTIL NOW? This feeling is called “retroactive guilt.” Educators feel the same way when we discover a new strategy or method and then think about all of the students we had in the past who did not have access to this better practice. The best thing to do is to start reading aloud now and make it a habit. For a list of titles that will engage kids at every age level, go to Scholastic’s list of 100 Best Read-Aloud Books. MY STUDENTS ARE NOT IN ELEMENTARY SCHOOL. WILL THEY ENJOY BEING READ ALOUD TO BY ME? Yes. Tweens and teens may not admit it, as adolescents seem hard-wired to resist any and all direction from the adults in their lives. But they will enjoy it as long as they find it interesting and they have some say in the book. The best read-aloud books are typically plot-driven. They can’t wait to see what will happen next. Consider these lists of possible titles from the University of Wisconsin-Madison. Older students also enjoy pictures books; they can even read them aloud to their younger siblings. Audiobooks to listen to on smartphones and in the car is another option. BUYING BOOKS CAN GET EXPENSIVE. HOW CAN I KEEP THE COSTS DOWN? Two words: Public library. Mineral Point has an excellent public library with helpful and knowledgeable staff. There is an entire floor dedicated to children’s literature. Library staff offers a storytime for little ones every Monday morning at 10 A.M. If transportation is an issue, consider utilizing Overdrive, a digital library of eBooks and audiobooks. Patrons can check out titles and download them on their smartphones, tablets, and computers. Overdrive also has dedicated pages for kids and teens. Reading aloud is an easy and enjoyable activity for any family hoping to raise a reader. At the Wisconsin State Reading Association Convention, some Mineral Point Elementary School faculty heard children’s author Mem Fox speak about the importance of reading aloud. Her ten commandments for reading aloud are applicable to parents and educators.